George Banks (David Tomlinson) and his wife Winifred (Glynis Johns) are in search of a nanny to look after their naughty children, Jane (Karen Dotrice) and Michael (Matthew Garber). Though many apply, oddly they are all blown away by a strong wind. Then Mary Poppins (Andrews), who glides down from the sky on her umbrella, is interviewed by the Banks and appointed for a trial period. She is no ordinary nanny and soon takes the children on many magical adventures. But what will happen after the trial period? Many of the nannies who were blown away at the beginning of the film were actually men in drag. When asked by a young Canadian writer, Yann Martel (Rafe Spall), about the story of his life, Pi Patel (Khan), who is settled in Canada, narrates the story of his childhood in Pondicherry and the origin of his name. He describes how his father, a zoo owner, decides to move to Canada when the municipality stops supporting the zoo. 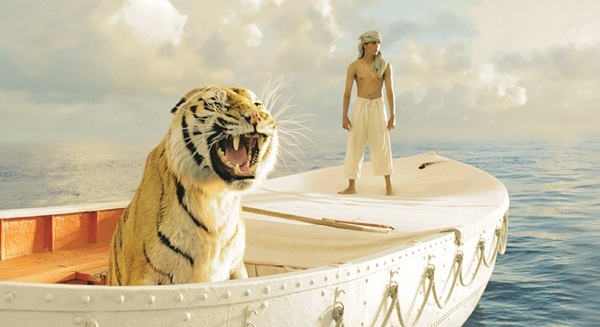 The Japanese cargo ship they board with all the animals sinks when a storm hits, killing everyone on board except for Pi, a zebra, an orangutan, a hyena and a male Bengal tiger nicknamed Richard Parker, who survive in a lifeboat. Soon Pia��s narration takes off to exotic islands and fantastic tales. Was there another side to the story? Tobey Maguire was originally cast as writer, Yann Martel.